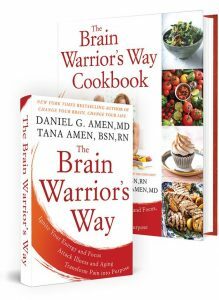 Dr Daniel Amen:	The Brain Warriors Way Podcast is brought to you by Amen Clinics, where we've transformed lives for three decades using brain SPECT imaging to better target treatment, and natural ways to heal the brain. For more information visit AmenClinics.com. Tana Amen:	The Brain Warriors Way Podcast is also brought to you by Brain MD where we produce the highest quality nutraceutical products to support the health of your brain, and body. For more information, visit BrainMDHealth.com. Welcome to the brain Warriors Way Podcast. And stay tuned for a special code for a discount to Amen Clinics for a full evaluation as well as any of our supplements at BrainMDHealth.com. Welcome back. I want to talk about something fun today. So, I got an email notification on my phone, and when I opened it up, guess what was there? Dr Daniel Amen:	I have no idea. Tana Amen:	You're supposed to be able to read my mind. Dr Daniel Amen:	Wish I could. No, I don't think I'd want to. Tana Amen:	So, it was Amen Clinics is actually in a study in the Journal of Alzheimer's disease. Dr Daniel Amen:	We're in the news. Dr Daniel Amen:	So many things. Tana Amen:	So, talk about the study. Dr Daniel Amen:	On everybody we see. Dr Daniel Amen:	And we call them at six weeks, 12 weeks, six months, and it's like, "Well, how are you doing?" And we have as far as I know, one of the highest success rates of any mental health organization for complex psychiatric problems. So on average, people who come to see us have 4.2 diagnoses, they have failed 3.3 providers, and five medications. And at the end of six months if we treat them 84% are better. Dr Daniel Amen:	But not everybody. And so for this study we looked at people who had depression, and it's like okay, who gets better, and who doesn't? So, what's the difference? And can we predict it on scans? Because if we can predict who's gonna have more trouble getting better, then we can wrap them more closely with services, and actually what we did in the paper, it replicated work from other centers showing if you have a healthier looking brain. Tana Amen:	So let me get this right. So you're more likely to get better if certain parts of your brain are not low in activity, but doesn't that mean if you actually find out, you actually look, and you know which parts are low, you can specifically treat those areas to increase the activity? Dr Daniel Amen:	Almost always. Tana Amen:	Okay, but you have to know? Dr Daniel Amen:	Almost always, and that's what's so exciting. So, what I learned a long time ago here at Amen Clinics, that people who have depression, it's not one thing in the brain. If you go to 999 psychiatrists out of 1,000, if you go to virtually 1,000 family doctors out of 1,000, or 1,000 OBGYN's or interns, they're gonna make a diagnosis of depression based on talking to you. Dr Daniel Amen:	Think of how insane that is. Dr Daniel Amen:	Right? If you have belly pain, someone's gonna look at your belly. If you have chest pain, someone's gonna look at your lungs, someone's gonna look at your heart. Dr Daniel Amen:	But if you have mental pain, nobody is going to look at your brain. Tana Amen:	Well, and language is subjective. So, based on your experiences, and where you come from, I mean, that's a very subjective way to come up with a diagnosis it seems like. Dr Daniel Amen:	Well, and I actually had a heated discussion with Nora Volkow who's the Director of the National Institute of Drug Abuse. Dr Daniel Amen:	And she's an imager, and I'm like, "Why aren't you recommending people image? More addicts?" And she goes, "Oh, the brain has language. The brain will tell you what's the matter," which I'm like, "Seriously? The brain will never tell you that it's underactive. It'll never tell you that it's overactive. It'll never tell you that it's been traumatized, and it won't go, hey look, I have Lyme disease," right? I mean, it's insanity that's going on. Tana Amen:	That just reminded me of our cat. I don't know why that reminded me of our cat, but that reminded me of our cat. Dr Daniel Amen:	Really? The cat? Tana Amen:	Yeah, no. Because our poor kitty, he's amazing. We have this adorable cat, and for the last few weeks he's been acting crazy. I mean, like seriously crazy. He attacks you whenever you walk by him, he reaches out grabs onto you with both paws, bites you, and he starts demanding your food off of your plate. Like he's been acting crazy. Dr Daniel Amen:	But you know what he's saying? Is, "I'm in pain, please help me." Tana Amen:	Right. So, he's trying to tell you something, but he can't tell you what's actually wrong with him. We had to go get him tested. Dr Daniel Amen:	And for whatever insane reason, people who have mental health problems, nobody has been looking at their brain, and that's what we are trying to do here at Amen Clinics. I mean, we do this day in day out, we've done 140,000 scans on people from 120 countries, and what the imaging tells us with depression, and that's the study we just published. Is there's certain people likely to get better, they have busy brains, they have healthier brains, and there are people who are gonna struggle getting better, doesn't mean they won't get better. What it means is we have to be more cautious with them, we have to do more stimulating things with them. You know, nine times out of 10 if somebody goes to a psychiatrist, or a family practice doctor's office they're gonna end of on an SSRI. Tana Amen:	Tell them ... Right. Dr Daniel Amen:	Reuptake inhibitor drugs. Dr Daniel Amen:	Like Prozac, Lexapro, Zoloft, Effexor, Selexa, Luvox, and they calm down activity in the brain. Dr Daniel Amen:	But what if you start with low activity in the brain, and then someone calms it down? You could actually disinhibit them, and make them act out on the sad, or mad, or even sexual feelings that they have, and they can end up killing themselves, or killing someone else, or hating themselves for their behavior that just got unleashed because their low frontal lobes got lower still. Tana Amen:	And I told ... I talked about my experience when I was depressed after having thyroid cancer in a previous episode about how that happened, and why I didn't trust sort of the psychiatric community because they wouldn't listen. Their response was, "Well, you just need to take more medicine." And it was the wrong medicine. Dr Daniel Amen:	And did the doctor ever ask you if you had a head injury? Tana Amen:	No, they didn't even get into my thyroid conditions. Dr Daniel Amen:	And this is a psychiatrist? Dr Daniel Amen:	At a major university. Dr Daniel Amen:	Yeah, it's insanity. We can do better. So, let's give you some tips if you've had depression, and you're not getting better, right? You went to your family doctor, and he put you on Zoloft, or Prozac, or Lexapro. Well, what can you do? What our study indicates is well, if you're not getting better you may in fact have low activity rather than high activity. Dr Daniel Amen:	And to stimulate your brain, exercise can really help, fish oil that's higher in a substance called EPA rather than DHA, more stimulating to the brain. It's actually not only been shown to be helpful for depression, but also for ADD, which is low activity in the brain. Stimulating antidepressants like Wellbutrin, so Wellbutrin's one of my favorite one especially for this pattern. Sometimes stimulants can help. If you have low activity in your brain, often it's secondary to a brain injury, and so sometimes things like hyperbaric oxygen can really be helpful, but the idea is there are so many things that you can do if you struggle with depression. And another thing for resistant depression, I was just thinking about it thinking about you, is thyroid medicine. Dr Daniel Amen:	Medication can actually be helpful. In one study 30% of people with resistant depression when they took thyroid hormone actually got better. Tana Amen:	Right. That's fascinating. Dr Daniel Amen:	There are some unusual medications, they're called MAOI inhibitors like Nardil, or Parnate, they tend to be more stimulating, and sometimes they're just miraculous. I've had that happen. And for resistant depression some doctors, even those of us here at Amen Clinics are using ketamine infusion because it sort of restarts your ... Jump starts your brain. Tana Amen:	So, we talk about this a lot, and sometimes I think it almost sounds like I don't know, it sounds like a cliché, or like we're just overusing it, and we just like mention it in passing. But one thing that has been ... I mean, obviously exercise for me is like, it's just a medicine. It's for sure medicine for my brain, but when I started meditating it just changed everything. When I meditate regularly, doesn't have to be for a long time, it can be for five minutes a day, it can be sometimes 20 minutes a day, just depends on my time schedule. But I can't explain it, at first it was difficult, it was challenging, and then after a few days, maybe even two weeks. Maybe a few days is wrong because at first it feels like okay, I'm learning how to do something new. But pretty soon I started to notice this just calmness, and this peace, and this feeling of happiness. I would look forward to that time, and it's just so helpful. Tana Amen:	It feels like that. Dr Daniel Amen:	But what you're actually doing is you're activating your frontal lobes. Tana Amen:	Right, and I don't know why it's just this feeling of happiness, and peace comes over you. So, it's very interesting. Dr Daniel Amen:	So, to review. If you have depression, and it's not getting better there's a whole bunch of things you should do, and if you have failed two or three serotonin drugs, you want to be thinking, "Okay, maybe I don't need to calm my brain, maybe I need to stimulate it." A good book of mine to read is Change Your Brain, Change Your Life. Dr Daniel Amen:	Testosterone in men, DHEA. In some studies DHEA has actually been found to be helpful for a person's mood. Dr Daniel Amen:	There are so many things that you can do, don't give up. Stay with us. ← Suicide, Drugs, & High School Football: What’s the Connection?